Before you can send a Landing Page message, you need to create a template in Messaging Studio. First, click on Create Template from the menu on the left side, your next screen will look like this. We would suggest that the best place to start is the Style tab. Here you can set the colours to use for your background, text and buttons. If, for example, you would like to have a purple button with white text on it, make sure that one of the colours is white, and one of the colours is purple. When you click on a colour, you will get a colour selection option, which also allows you to add a hex value to match the specific colour of your logo, for example. You can also increase the Page Padding here (this increases the space left around your text and images if you want to show more of the background colour), and the Item Spacing (this creates more space between your images and text blocks). Click back to the Add Blocks tab. Before you get started, it’s important to understand what the three sections are in the layout editor. The top section is the most flexible part of the Landing Page message. You can add images and text in one, two or three columns to this area, and it will expand (length-ways) to accommodate as much content as you add. Top tip – keep this content within the default box height to ensure that your message will look great in all messaging apps. Messaging Studio is designed to encourage you to create rich content that can be viewed and interacted with on other messaging apps such as RCS and Apple Business Chat, as well as via an SMS Landing Page. These platforms all prefer you to limit your image content to approximately the top half of your total message. 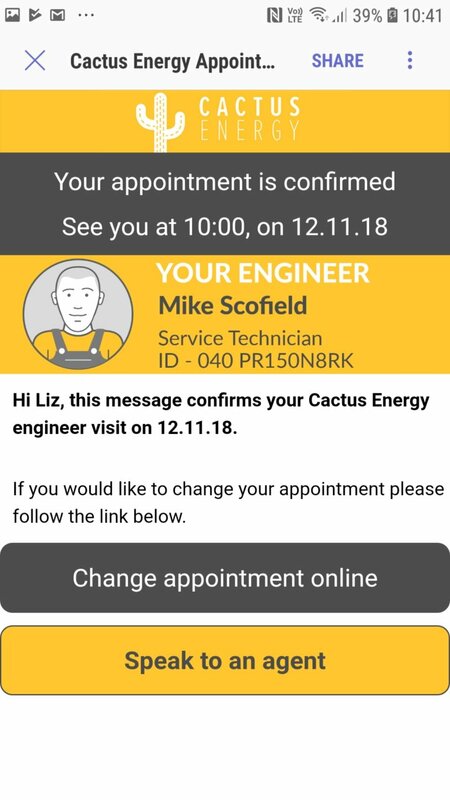 If you start to see a vertical scroll bar appearing in this section, customers viewing your message as a WhatsApp or RCS message, will see a cropped version of the full message. This won’t be a problem if you do not intend to send the message as WhatsApp or RCS, but it is worth remembering. To add content to this section, click on the green + icon on your preferred block from the choices on the right side of the screen. 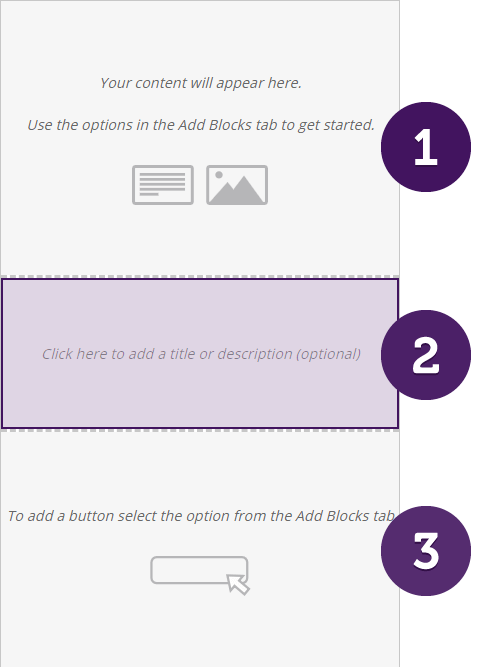 Once the block is on the template, click on it to change it to a text or image block. If it’s an image block you’ll be prompted to drag ‘n’ drop or upload an image from your computer. You can resize the image using the Image Size drop down menu, and left, right or centre align the image. If it’s a text block, you’ll be prompted to add text. 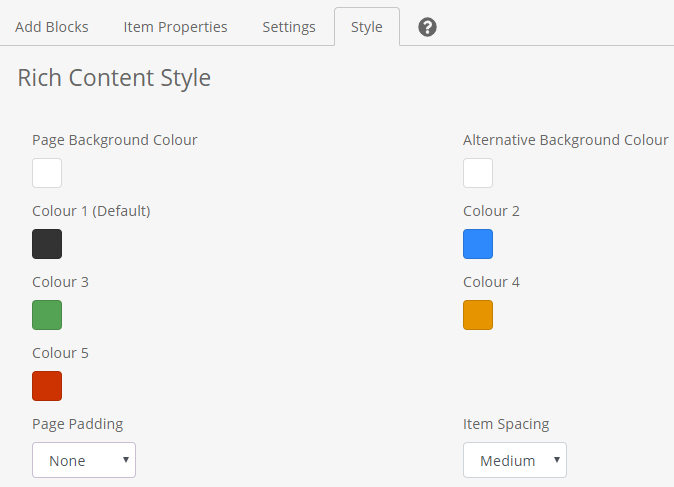 You can alter the colour using one of the five selections from the Style tab, change the size, alignment and font weight. You can also personalise this content to include a customer’s name, details of their appointment, key dates or the value of a bill payment – view our detailed guide to personalising your Landing Page. You can keep adding to this section with multiple text and image blocks, and use the arrows to move blocks around, and the bin icon to remove them. Next, click on the Item Properties tab. The middle section of your template is a plain text section – you can’t change the font size, colour or background. This is to allow the text content to appear on all messaging apps consistently. If you are only building your template to send as a Landing Page, you do not have to use this section, and can keep building your content using the top section. 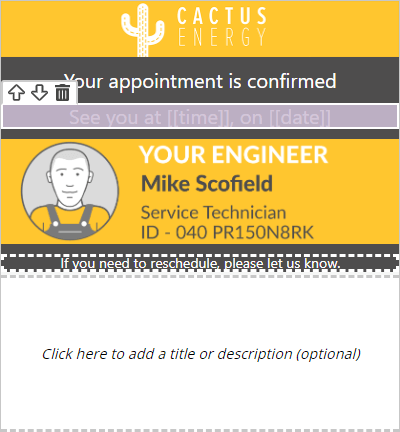 The final section of your template allows you to add CTA buttons, which can link off to a web page, connect to your phone’s calendar, or trigger a text, email or phone call. You can find out more about button formatting here. To add a button, click on the button block from the options on the right. 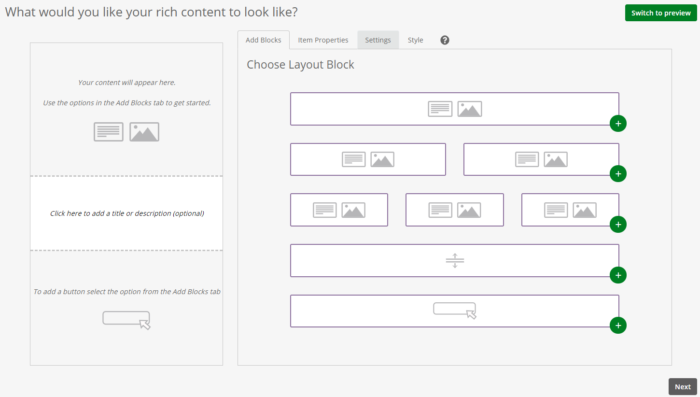 It will automatically position itself in the button section of the template. Click on this, and you can add the button text, the required action of the button when it’s clicked, the colour and text size. You can add multiple buttons if you wish. At any time during your template creation you can preview what the finished message will look like either delivered as an SMS Landing Page, or RCS. Click on the ‘Switch to preview’ button at the top right to toggle this view, and then ‘Switch to editor’ to return back to the editing screen. You will notice that there are differences between the RCS view and the SMS Landing Page view – if you are only intending to send the message as a Landing Page, the only view you need to consider is the one titled SMS. This area allows you to control how the Landing Page will be viewed on the recipient’s phone. The Page Title is what appears in the tab of your internet browser (see example below left). The Web Preview Title appears in the preview within the Messages app (see example below right). The Web Preview Image also appears in the preview within the Messages app – although it’s worth noting that not all handsets include this preview feature. You’re now ready to save your template. Click on the grey ‘Next’ button at the bottom right of your screen. This will take you to the preview screen for one last look at your message. Click next again and you’ll have some final options. Firstly, you need to name your template. This won’t be seen by customers and is for your reference only. Secondly, you need to say for how long the campaign data needs to be saved. This helps your compliance with GDPR as the Messaging Studio will delete all data relating to the campaign after your specified period. You do not have to decide what your SMS message will say at this point – but that’s what the next field is asking for, so feel free to fill this in now if you like. You’ll have the opportunity to do this when you come to send the campaign if you prefer. You will need to specify the sender of the message. If you would like to receive a reply, this needs to be a short code or virtual mobile number (more about receiving replies here). If you do not want direct replies to this message, you can change it to a Sender ID which should identify your brand (more about Sender IDs here). 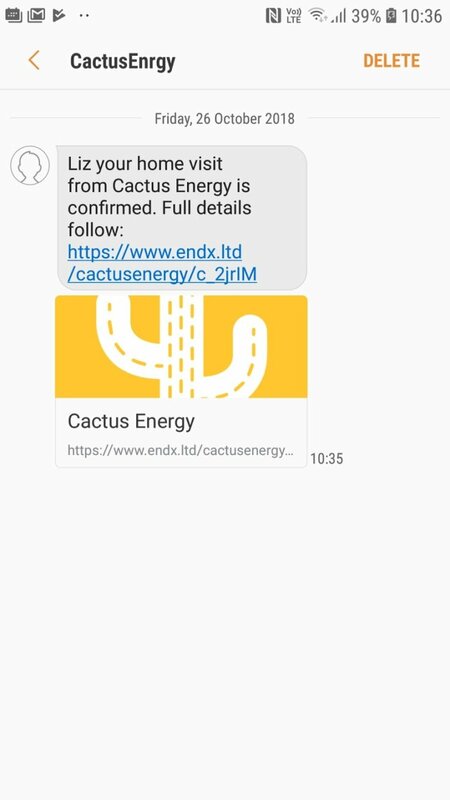 In the above examples you may have noticed that the URL shown in the text message included the brand name ‘cactusenergy’ – to include your brand name in the short version of the URL, add it to the ‘branded URL text’ field. If you want to send your message with unicode characters – emojis etc. – make sure you change the default setting away from GSM to Unicode (find out more about Unicode and adding emojis to your messages). Finally, you can set an expiry date for the Landing Page message. Click Save at the bottom right and you have completed your template.